The Kingdom of Saudi Arabia offers a unique and remarkably interesting view when observed through the lens of social media. As an open and democratic perspective, social media has revealed aspects of this wealthy and conservative nation that have rarely been seen throughout its long history. With over 14 million registered users, Facebook tops the social media charts in Saudi Arabia. Saudis have taken to the platform with great enthusiasm and delight. 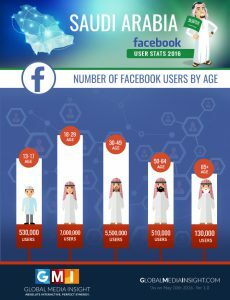 The attached infographic offers a detailed and interesting perspective on Facebook usage in the Kingdom of Saudi Arabia based on gender, age and city. One of the most revolutionary effects of Facebook on Saudi Arabia is how it has offered women an expansive new space for expression and socialization. 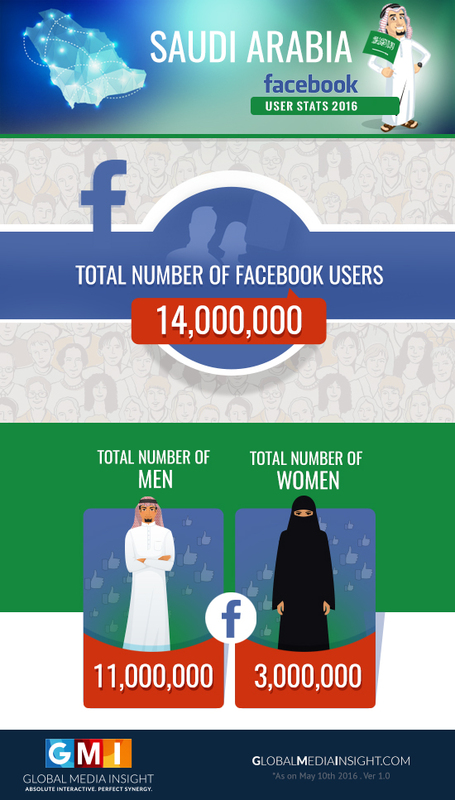 Of the total 14 million Facebook users in Saudi Arabia, 3 million are women. Women in the Kingdom are stepping out and connecting with like-minded individuals around the globe through Facebook and other social media. This is sure to have a positive effect on women’s rights and their contribution to society. The usage data based on age groups does not deviate significantly from global trends. The largest number of Facebook users (7 million) in the Kingdom of Saudi Arabia belongs to the 18-29 age group followed by the 30-49 age group with 5.5 million. The data also reveals a significant number of users (640,000 +) above the age of 50 signing up for the platform. This means that Facebook has been able to penetrate the age barrier in Saudi Arabia by presenting itself as an attractive and easy-to-engage forum, even for a more senior audience. 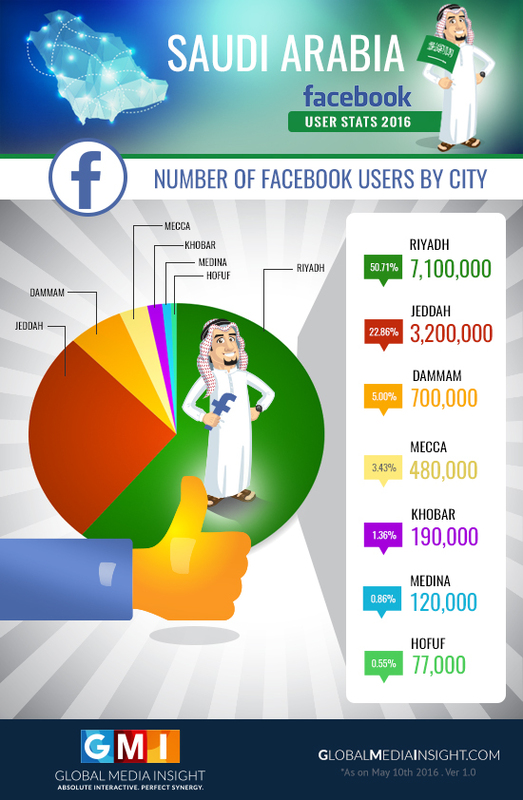 The data shows that a significant majority of Facebook users in Saudi Arabia come from within city boundaries. Riyadh, the most populated city, contributes more than half of the audience with 7.1 million users. Jeddah contributes about 3.2 million. Cities like Dammam and Mecca rank a distant third and fourth respectively. Take a look at the graphic below to learn further about Facebook usage in the cities of Saudi Arabia based on age groups. Facebook and social media services of its kind have contributed to a better connected, more conversational Saudi Arabia. Residents of the Kingdom are using the platform to engage in daily conversations about politics, social issues, religion and much more. And owing to its acceptance in the daily affairs of the country, it is easy to see that Facebook will play a significant role in the future of the Kingdom and its residents. If you are an individual or a business looking to better connect with your clients in Saudi Arabia or elsewhere through Facebook, we, at Global Media Insight, can help you out. With over 14 years of experience in digital technologies and social and digital markets, we excel at driving engagement by optimizing your business’s reachability and connections. Get in touch with GMI to establish effective and robust social media strategies that span platforms and channels.